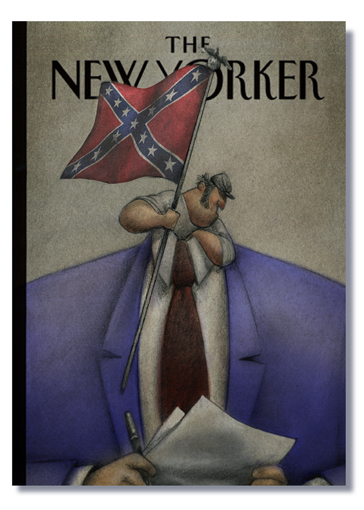 I've always admired how the New Yorker covers are always illustrated with no article headlines to clutter the work. The South shall rise again! Out of the necks of headless news anchors. Or perhaps the free market will lead to a reassertion of State's rights? Either way, I think this will be a controversial cover, John. :-) I'm looking forward to it. I like creating little fantasy projects. It's a good way to work out ideas and see what they would look in a viable context. Yet another one I really like (nothing to do with slavery or racism, everything to do with standing up to Federal/mob tyranny; noobs, search the site--my position on equality & individual human rights is crystal clear). I was thinking maybe if Johnny Reb had a tri-corner hat & a Gadsden flag it might be a little less offensive--but Lefties squall like banshies over the tiniest non-offense. Anyway--it's not like we really have to worry about the fallout over something that will never happen. Hmmm.....the rise of BIG BUSINESS in the South. While it swirls the drain in the north. Go figure. I was playing with the concept that an Inner Redneck still exists in the enlightened Urbanite. This page contains a single entry from the blog posted on June 3, 2012 12:51 PM. The previous post in this blog was Illustration Friday: Hurry.